"I heard his words and their meaning was revealed to me." This year to celebrate Bloomsday (June 16th, the day on which James Joyce's novel Ulysses takes place, named for the book's everyman hero Leopold Bloom) I'll be participating in some festivities over at Malvern Books on West 29th St here in Austin, starting at 6:30 pm. There will be music, food, drinks, readings from the book and I'll be delivering an introductory talk. Incredibly, the Day of Bloom will be celebrated in many locales across the globe, including and especially China as The Guardian details. To commemorate the big day here I'd like to share something I've been intending to post for a long time. Below you can listen to the only recording Joyce ever made of himself reciting from his most famous book. It's a selection from the "Aeolus" episode, recorded in 1924, featuring a character delivering a speech likening the plight of the Irish with that of the Biblical Hebrews, with lots of Egyptian imagery. — Mr Chairman, ladies and gentlemen: Great was my admiration in listening to the remarks addressed to the youth of Ireland a moment since by my learned friend. It seemed to me that I had been transported into a country far away from this country, into an age remote from this age, that I stood in ancient Egypt and that I was listening to the speech of some highpriest of that land addressed to the youthful Moses. — Why will you jews not accept our culture, our religion and our language? You are a tribe of nomad herdsmen; we are a mighty people. You have no cities nor no wealth: our cities are hives of humanity and our galleys, trireme and quadrireme, laden with all manner merchandise furrow the waters of the known globe. You have but emerged from primitive conditions: we have a literature, a priesthood, an agelong history and a polity. The sound quality is poor but the powerful message still resonates. There is great significance to this seemingly random passage from Joyce's giant book. He insisted it was to be the only selection he would ever record. Even though Joyce told Sylvia Beach (the book's publisher and supporter) that he'd chosen this passage "because it was declamatory and therefore suitable for recital," Beach knew there was something else to it. "I believe that it expressed something he wanted said and preserved in his own voice," she wrote. "graven in the language of the outlaw." On the recording, you hear Joyce's relish of "outlaw," reinforcing his own role as an exile, as the writer in an outlaw language, and as a participant in the outlaw creation of a new Irish literature. But the central word is "graven," as an engraving, as a text that is both positive and negative, and as a voice that is in several senses coming from beyond the grave. And I'd like to add: Joyce the outlaw was also being publicly excoriated and condemned for his "obscene" and "filthy" book. At this point, in 1924, he had equal fame and notoriety. The greatest novel in the English language was banned, confiscated, and burned in the US and the UK for over a decade after its publication in 1922. That final line is Joyce's eloquent middle finger to the authorities, the phony arbiters of moral justice. 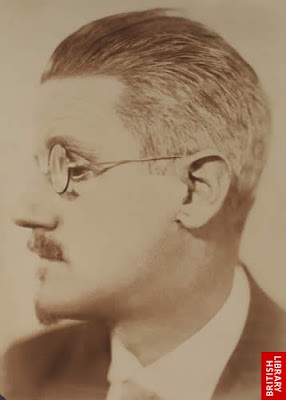 (This post owes a great deal to an old James Joyce Quarterly article by Adrian Curtin entitled "Hearing Joyce Speak: The Phonograph Recordings of 'Aeolus' and 'Anna Livia Plurabelle' as Audiotexts.)" A few days late and a few dollars short but thanks for this. I am wondering if I heard this in the Joyce Museum in Dublin, a day or so after another Bloomsday years ago. I hadn't even finished Ulysses yet, though had it with me. I know I heard some recording of his voice and I have to think it was this rather than Finnegans Wake as that wouldn't have signified as much to me at the time. I do remember being surprised by the sound of his voice, as we often are when we've only read someone's work. I wish there were more of these. He has a great voice and his varying tones (especially notable here where he voices the narrator, Stephen's inner monologue, and the character delivering this speech) are instructive for how we ought to experience his multivalent texts.